There are many aspects of the physical school space that may make it awkward or unsuitable for educational use, which includes teaching and learning but also social activities. A coherent body of mainly correlational evidence attests to a relationship between the quality of the school environment and student outcomes, where those in poorer environments tend to have poorer attitudes and behaviour as well as lower attainment (Kumar et al., 2008; Durán-Narucki, 2008). The diversity of the school community, range of outcomes that might be desired and the complexity of the relationships between setting, use and actors, however, tends to scupper any attempt at simple prescriptions or reliable causal relationships (Uline et al., 2009; Woolner et al., 2007). Yet it is possible to discern elements of school space where evidence has accumulated of direct and indirect effects, generally negative, on student learning and of impacts on educational achievement. Below the evidence related to the environmental aspects of noise, poor air quality and restricted space will be considered. Poor air quality is likely to impact indirectly on educational outcomes through causing health problems that reduce attendance and so opportunity to learn (Rosen and Richardson, 1999), but there is also some evidence of contaminated or stale air having a direct impact on learning. Pollutants and contaminants in external air entering the school which were previously common in the UK (e.g. lead) have in recent years been much reduced, of course, but there is still air of poor quality in urban areas and this tends to be inequitably distributed, favouring the wealthy over the poor. Children living in these unfairly affected areas of the city and attending their neighbourhood school will be breathing this same poor air at home and at school with possible consequences for their health. In addition, details of the school environment may heighten problems due to polluted air and, particularly, stale air. Specifically, researchers have warned that ‘fleecy’ furnishings or open storage may increase dust, which contains irritants and allergens (Smedje and Norback, 2001). This problem will be worsened if ventilation is inadequate and worryingly many studies have shown that classroom spaces tend to have low levels of ventilation, producing unacceptably high levels of carbon dioxide as well as of any contaminants. Recent research suggests that such high levels of carbon dioxide may have direct effects on learning through reducing students’ attention and accuracy (Bakó-Birób et al., 2012). Although it is unclear how ventilation levels are distributed across schools, it seems probable that within schools where there are concerns about external air pollution or road noise, staff are more likely to limit window opening, reducing ventilation rates. A number of studies of environmental noise, due to proximity to airports, railway lines and major roads, have demonstrated that living with chronic noise appears to cause stress and ill health (Stansfeld and Matheson, 2003) as well as having a negative effect on learning (Haines et al, 2001). These noise problems are often present in urban areas but will be unevenly distributed across the city with poorer areas often found near noise sources, particularly busy roads. In addition to the studies of problems associated with living in noisy places, there is a body of research evidence linking noise in schools to specific learning problems. An early US study in an urban school found lower reading levels for children taught in classrooms on the noisy side of the building next to an elevated section of light urban railway (Bronzaft and McCarthy, 1975). Further, consistent evidence of detrimental effects on speech, language and reading from such situated studies (Evans and Maxwell, 1997) is backed up by controlled laboratory experiments that show noise adversely affecting elements of learning such as memory. As has been noted by researchers in this area, problems of external noise near the neighbourhood school will often be replicated in the nearby housing, so reinforcing the unfair distribution and, potentially, the negative impact on well-being and intellectual development (Shield and Dockrell, 2003: 102). It must be noted, however, that more recent research measuring noise levels in UK schools (e.g. Shield and Dockrell, 2004) suggests that problematic noise levels tend to result from internal noise, either within the specific classroom or from adjoining school spaces. As I have discussed elsewhere, requirements for reduction of internal noise in schools need to be treated with some caution, given that some noise may be productive and educationally important (Woolner and Hall, 2010). It is also worth remembering the consequences of poor air quality discussed above if schools are tempted to install carpets and softer furnishings to reduce noise or reverberation. Designing closed learning spaces and keeping internal doors shut to limit noise leakage may also have negative implications for ventilation, which staff in city schools may be reluctant to ameliorate by opening external windows, as discussed above. It is notable that these intrinsically linked problems of poor air quality and noise are frequently due, in a city setting, to transportation with inequities underpinned by the tendency of poorer people to be ‘both “less travelled” and “travelled upon”’ (SDC 2011b: 5; 47). It is also important to observe that alongside the direct detrimental effects on learning and health shown by research, the noise and air quality problems of our city school are likely to feed into more complex networks of effects. Less positive attitudes from students, reduced satisfaction of staff and a sense of constraints on teaching and learning practices feed into the complexity of processes through which physical problems drive and so compound usage, choices of activity and social relationships in school. Possible tangible results include problems like low staff retention rates or reduced student numbers. Within the current UK climate of heavy inspections and demands for particular academic outcomes, problems can accumulate and result in a ‘less effective’ school that may slide into a spiral of decline. Turning to the third challenge of the physical school setting, it is worth noting that the evidence base for this aspect of the school environment is not as conclusive as for the challenges of air quality and noise. However, as we shall see, this may be an effect of circumstance and the history of research interests rather than a reflection of the evidence potentially available. 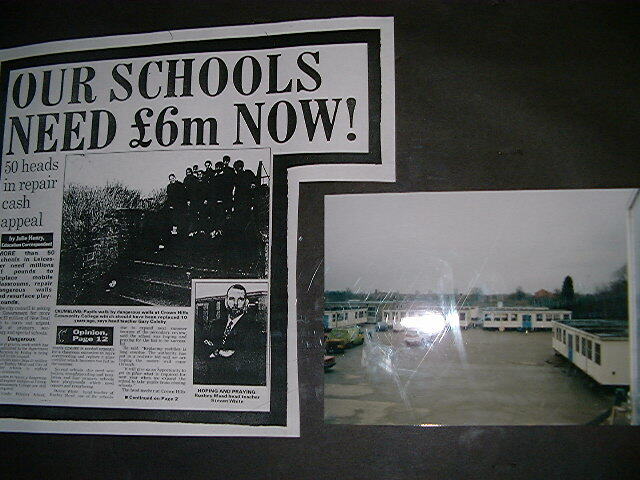 During the 1970s evaluations of open plan school designs referred to the necessity of adequate space. A detailed research study of open plan primary schools carried out at this time concluded that overcrowding was often a problem (Bennett et al., 1980). An NUT report into open plan schools published a few years earlier, when school numbers were particularly high, made this point about space quite forcefully. A teacher responding to their survey stated: ‘There can be no movement or activity on any scale where there is no room to move’ (NUT (England), 1974: 29). In addition to these direct problems with lack of space, a more crowded classroom or school is also likely to be noisier and more difficult to ventilate, problems which, as described above, can in themselves interfere with learning. A small, but carefully conducted, piece of research in the 1980s attempted to compare the attitudes of learners in two spacious primary classrooms with those in two cramped classrooms, where the space per pupil was considerably less (Clift et al., 1984). Statistically significant differences were found between students in the cramped and spacious classrooms for questionnaire responses relating to relationships and attitudes within the classroom and class group, which we might expect to affect their learning. The authors of this study concluded that their results were ‘necessarily tentative’ (ibid. : 212) and that further, larger scale, research projects were needed. However, decreasing school populations during the 1980s and 90s meant that this issue seemed a less pressing concern and the possible impact of restricted learning space has received little attention. In contrast, in both the UK and the US here has been substantial research into the impact on learning of the closely related issue of class size, in terms of the number of students. In fact research in this area generally conflates the two issues since classes reduced in size may be taught in existing classrooms and so experience both reduced class size and reduced classroom density. Yet when area is examined, it does seem to be important. A piece of US research specifically investigated the relationships of a number of variables with both area per child in the classroom and class size (Maxwell, 2003). This did not find significant effects of class or school size on the outcome measures, but instead discovered statistically significant associations between classroom spatial density and reading for girls and between classroom spatial density and behavioural disturbance for boys. Although it is not clear why there is a gender difference in the apparent impact of space per child, this research adds further support to the suggestion that restricted classroom space has a negative effect on learning. The practical effects of restricted space on both learning and teaching practices was revealed to me during some recent research working with a local north east primary school. Two Year 3 maths lessons were observed, running concurrently, in two very differently sized enclosed classrooms (areas of 55m² and 44m² to accommodate between 28 and 30 children). In the larger room, the teacher was able to make longer and considerably more varied use of the floor space, with transitions achieved smoothly. The children in the smaller room did not fit into the ‘carpet space’ and, presumably for this reason, they were mainly seated at desks during the lesson observed, while the teacher explained examples using the ‘interactive’ white board. Bennett, N., Andreae, J., Hegarty, P., & Wade, B. (1980). Open plan schools. Windsor: Schools Council Publishing/NFER. Davoudi, S. and Brooks, E. (2012) Environmental Justice and the City: Full Report Newcastle: GURU, Newcastle University. Durán-Narucki , V. (2008). School building condition, school attendance, and academic achievement in New York City public schools: A mediation model. Journal of Environmental Psychology 28: 278-286. Evans, G. W. and Maxwell, L. (1997) Chronic noise exposure and reading deficits. The mediating effects of language acquisition, Environment and Behaviour, 29(5): 638–656. Kumar, R., O’Malley, P.M. and Johnston, L.D. (2008). Association between Physical Environment of Secondary Schools and Student Problem Behaviour. Environment and Behavior 40(4): 455-486. Rosen, K. G. & Richardson, G. (1999) Would removing indoor air particulates in children’s environments reduce rate of absenteeism- A hypothesis. The Science of the Total Environment, 234, 87-93. Smedje, G. & Norback, D. (2001) Irritants and allergens at school in relation to furnishings and cleaning. Indoor Air, 11: 127–133. Shield, B and Dockrell, J. (2003) The effects of noise on children at school: A review. Building Acoustics. 10: 97-116. Shield, B.; Dockrell, J. (2004) External and internal noise surveys of London primary schools, Journal of the Acoustic Society of America. 115: 730-738. Uline, C. L., Tschannen-Moran, M., & DeVere Wolsey, T. (2009). The walls still speak: The stories occupants tell. Journal of Educational Administration, 47, 400–426. Woolner, P., Hall, E., Wall, K., Higgins, S., & McCaughey, C. (2007). A sound foundation? What we know about the impact of environments on learning and the implications for Building Schools for the Future. Oxford Review of Education, 33(1), 47–70. This entry was posted in Governance, Uncategorized and tagged buildings. Bookmark the permalink.